Liina Laas talks to Blockleaders’ Paschal about the transformational power of entrepreneurialism and education in FinTech, gender equality, and the availability of sandwiches. Not too long ago, Liina Laas was waiting at a train station in her native Estonia. Feeling a pang of hunger, she went looking for a sandwich. She had recently become a vegetarian and was dismayed to find that the local supermarket had no meat-free sandwiches on its shelves. Liina’s was understandably annoyed and was tempted to write a strongly worded letter to the company owner. However, she decided instead to take matters into her own hands, and what she did next is a fascinating insight into her character. I put it to Liina that most people would have just whinged about this to their friends or, at most, posted a remark about the incident on Facebook. Any idea about doing it themselves would quickly give way to self-doubt and fear of failure. Being from Estonia helps. For a nation with a population of only 1.3 million, only slightly more than Birmingham, Estonia has become a blockchain powerhouse. While other countries looked on in confusion as businesses and individuals flooded into the blockchain space, Estonia took the bull by the horns by becoming the first state in the world to put its inhabitants’ health records on the blockchain. Estonians have grown used to interacting with the state digitally, whether through electronic voting or paying taxes online, even identification has become digitised. Wired called the country the “most advanced digital society in the world”. “When we founded the Cryptocurrency Association, the government was quite against it. At that time there was a regulation that required that any crypto transaction worth more than €1000 had to be done face to face, to comply with anti-money-laundering laws. On top of that, VAT was applied to every single cryptocurrency transaction. We lobbied the government about these issues, and one unhappy Bitcoin miner took the state to court. Liina believes the same rationale can be used to modernize and simplify the insurance industry, which also suffers from the perception of a lack of transparency. Her work as Chief Business Development Officer at Black Insurance allows her to use her experience in FinTech- and blockchain-focussed marketing to explain the inherent weaknesses of that industry’s working model. Her down-to-earth style and gift for public speaking are visible in the high calibre pitches she conducts for Black where, alone on a stage in front of hundreds of people, she captivates her audience without any gimmicks or props. Where does the confidence to do this come from? 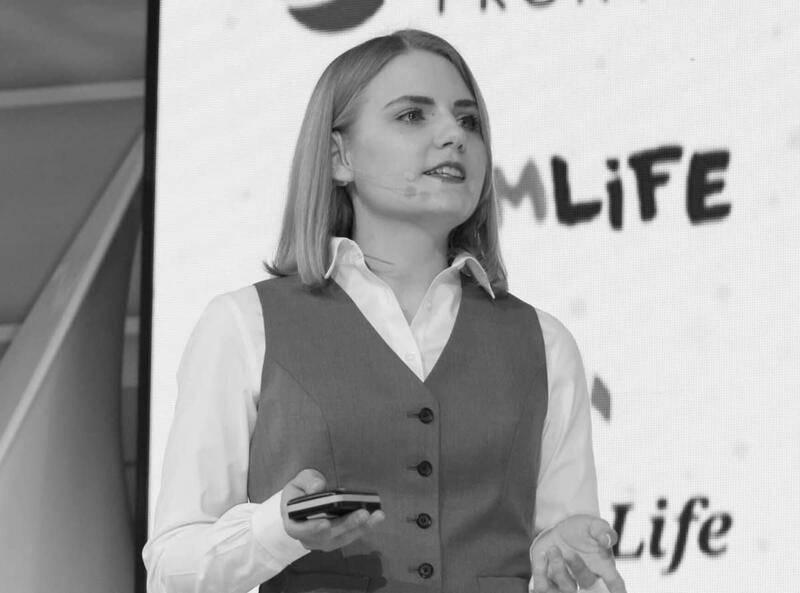 Watching videos of Liina presenting her pitches and giving talks on blockchain and fintech, it is difficult not to notice that she is often one of the only women on the stage at an event and female faces are few and far between in the audience of these gatherings. The Sausagechain, as Liina has rebranded it, dominates the blockchain and FinTech space and Liina has given a lot of thought for the reasons behind this. On the broader issue of women in business, the problems are more complex and a cultural shift is required. “My mother was a violinist. When she got married she wanted to be a homemaker. That’s what she did. She wanted a clean house, liked to stay at home with her children. She ironed my father’s clothes. Her parents divorced and, to her, having a happy family life was the fulfillment of her childhood dreams. Family will affect you, but it doesn’t mean that you will do what you saw at home. “But that doesn’t explain the pay gap that exists between men and women. In Estonia it is 24%. You can’t just say, well women should just work harder, because they already do. Governments and regulators can only do so much. Women ask for less money. Why do women value themselves less than men? I met a banker at a conference who told me that when he is interviewing candidates, women will regularly ask for 20% less than men. He could interview a woman who is more qualified and experienced than the male candidate. The man will ask for more money. Okay, the woman gets the job because she is the better applicant, but the banker is hardly going to offer her that extra 20% that she hasn’t asked for. Liina understands the importance of role models, having had so many herself but, as a young girl, she was determined to follow her own path onto the front pages of the business press. Liina, like many of the Blockleaders I have spoken to, has moved quickly through different businesses and careers. She is now concentrating on her own marketing and consulting agency CryptoHype Media. The modern business leader, it would appear, is not content to enter a company on the ground floor and take the slow journey upwards through its ranks and onto the board of management, reaching the top just in time for retirement. But are we prepared for the dynamism expected of us, as modern workers? Now, with two young children and a husband who lovingly refers to her as the “dirty capitalist”, Liina enjoys life in Estonia, although she doesn’t hesitate for a moment in saying yes when I ask if she would move to Singapore, which she visited recently. Although she’s not ready to uproot her family just yet, she has the confidence and self-belief to reinvent herself, as she has done before. Finding blockchain was key to her transformation in business. The key to Liina’s success, and what makes her such an easy person to talk to, is her indefatigable interest in people. You can read more about Black Insurance here. Liina’s marketing and consulting agency CryptoHype Media can be contacted here. Connect with Liina on LinkedIn.